Measuring to Maximize Tool Life Modern Machine Shop 65 In reality, though, a system such as this is liable to be impractical. The much more achiev- able approach in production (and therefore the more common approach) is to use customized hard gages to provide a quick and simple pass/fail confirmation of the part, with tool replacement occurring according to an unrelated count of how many workpieces have been run. To avoid the risk of scrapping parts, that predetermined count is always set to be conservative, meaning some of the potential use of cutting tools is routinely lost as those tools are changed out before they truly reach the end of their lives. 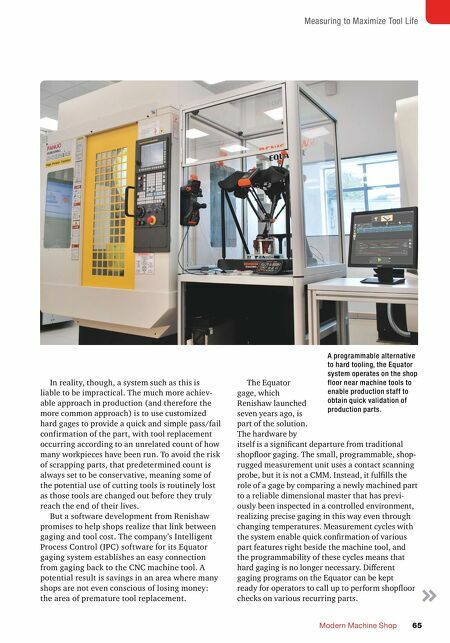 But a software development from Renishaw promises to help shops realize that link between gaging and tool cost. 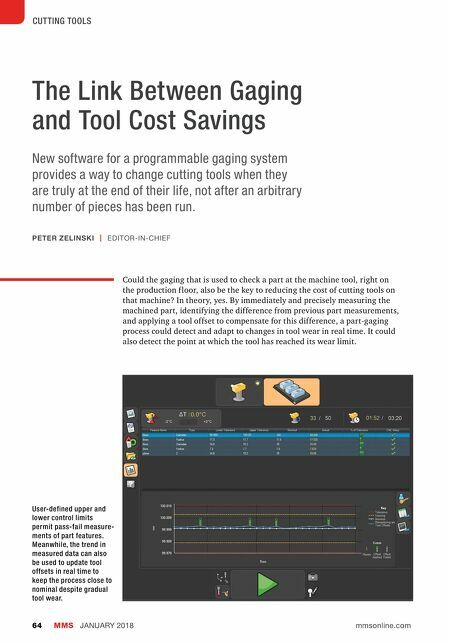 The company's Intelligent Process Control (IPC) software for its Equator gaging system establishes an easy connection from gaging back to the CNC machine tool. A potential result is savings in an area where many shops are not even conscious of losing money: the area of premature tool replacement. The Equator gage, which Renishaw launched seven years ago, is part of the solution. The hardware by itself is a significant departure from traditional shopfloor gaging. The small, programmable, shop- rugged measurement unit uses a contact scanning probe, but it is not a CMM. Instead, it fulfills the role of a gage by comparing a newly machined part to a reliable dimensional master that has previ- ously been inspected in a controlled environment, realizing precise gaging in this way even through changing temperatures. Measurement cycles with the system enable quick confirmation of various part features right beside the machine tool, and the programmability of these cycles means that hard gaging is no longer necessary. Different gaging programs on the Equator can be kept ready for operators to call up to perform shopfloor checks on various recurring parts. A programmable alternative to hard tooling, the Equator system operates on the shop floor near machine tools to enable production staff to obtain quick validation of production parts.